Unicorn Purple Money Box Discounts Apply ! Designed for the fun things of dreams and wishes. 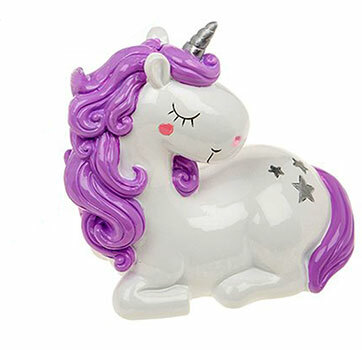 This Purple Unicorn Money Box Made from Durable Resin with plastic push in pull out flap for getting the money out on the bottom (NO NEED TO BREAK) . There are 3 in this Group Blue, Pink and Purple. Comes Bubble Wrapped in a Decorative box and is part of the Unicorn Collection.